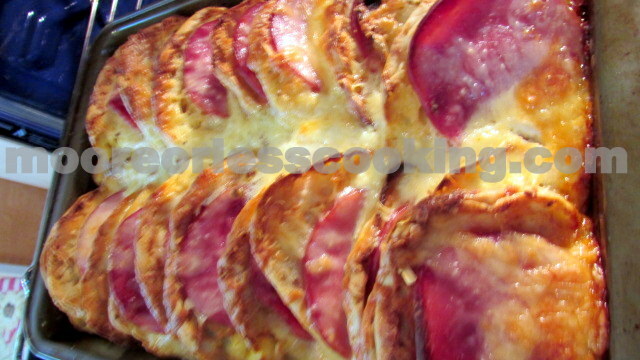 Strata means layers… generally layers of egg-soaked bread and meat of some kind (ham, sausage, bacon) and cheese. It is baked like a casserole. This is the other very popular strata ( Overnight egg casserole) that I prepared for the Bridal Breakfast that I catered last month. Other Items on the menu were a BROWN SUGAR STREUSEL COFFEE CAKE, Blueberry Crumb Coffee Cake, OVERNIGHT SAUSAGE AND EGG BAKE, Overnight Vegetarian Egg Bake, Fresh Fruit Salad, Coffee and Juices. I did all of the preparation the day before, so the morning of the breakfast, I just popped the strata’s in the oven so that they would be warm and ready for a beautiful breakfast. I doubled this recipe since there was a party of 23 people. Martha Stewart’s recipe calls for Canadian Bacon, but I substituted small round ham, the same size as the English Muffin. I love making this dish the night before, then all you have to do is pop it in the oven in the am and you have a delicious breakfast. Perfect for parties, holidays or just when you want an easy breakfast or brunch. Generously Butter a 2-quart shallow baking dish (oval or square); set aside. In a baking dish, alternately arrange, cut side down, muffin halves and Ham. In a large bowl, whisk together eggs, milk, mustard, ½ teaspoon salt, a pinch of pepper, and hot sauce until combined. Pour over English muffins and ham; cover tightly with plastic wrap. Refrigerate at least 2 hours and up to overnight. Place baking dish on a rimmed baking sheet; remove plastic wrap. To test to see if it is done, use a sharp knife and insert in center; it should not be jiggly, but should feel firm and the knife should come out clean. Arrange the muffin halves and Ham upright for beautiful presentation and easier serving. When cutting, you'll be able to see the layers and make sure each portion contains a few pieces of bread and ham. Nettie Moore is the cook, baker, photographer and designer behind Moore or Less Cooking Food Blog. Nettie is a self-trained cook and baker. She loves creating easy recipes that don’t call for a lot of unknown ingredients. Nettie’s Blueberry Skillet Cake has been featured in Taste Of Home Magazine and her Peach Raspberry Pie has won awards! She was born and raised in Southern California and now calls New England her home, where she lives with her husband and two children. Follow Nettie on her blog, Moore or Less Cooking, or on FACEBOOK | TWITTER | GOOGLE+ | PINTEREST | BLOGLOVIN | INSTAGRAM| Free email subscription here. 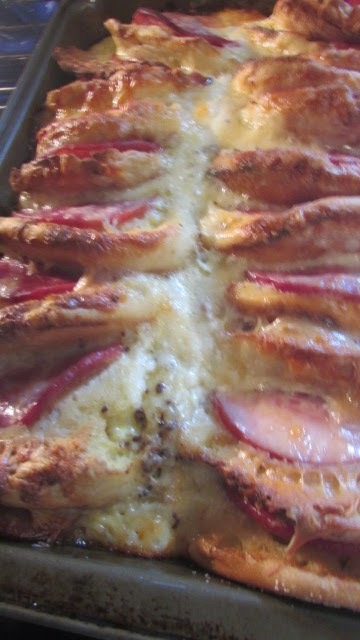 I would love to have this strata for breakfast! I am sure all guests were very pleased! Thanks for coming and linking up at The Weekend Social. All posts get pinned on our pinterest board! Please be sure to come back next week starting Thursdays at 9PM EST on culinaryflavors.gr! I hope to see you there!